Max Gate is the Victorian house that Thomas Hardy designed himself, and it's a great looking house. It's in Dorchester and was on our To Visit List during our stay near Swanage last Spring. It was a damp and grey day on our visit and so our visit started in the house, but there were many glimpses on the garden as we made our way around. It was the type of garden that was like our own domestic gardens. It was probably a bit larger than most domestic gardens, but what I mean is that it wasn't one of those grand and well manicured gardens. That's not to say it wasn't charming, it was, but it was quite normal, if you know what I mean. Almost as soon as we entered the garden we were at the potting shed, which you'll know is regularly my highlight of any garden. This one was small and it seems that Hardy wasn't such a fan as me, as it seems that a shed only appeared on the records in 1928, which is the year of his death. I can't imagine that his dying wish was to build a potting shed, so I suspect someone took charge when they could. Perhaps it was Bertie Norman Stephens, the gardener from 1926. This blackboard in the shed sheds (no pun intended) more light on the gardener and his tasks. What was great though was you could actually get in the shed and have a nose around among the seedlings. And it was the first time I've seen peas hanging up like this, and it gave me an idea - as well as reminding me that guttering is great for peas. You might be wondering how I knew these were peas, well the photo below gives that away. Look closely and the guttering is pretty special too. It's not the plastic sort I have, and totally in keeping with a make do and mend approach to life. There was also produce available for donations, just look at that rhubarb. From many parts of the garden you got a great view of the house. It's the kind of house that really appeals to me, one with nooks and crannies and plenty of architectural detail, and not box-shaped at all. I'm sure the number of roofs and varying heights makes it a nightmare to maintain, but it's a good looking house. 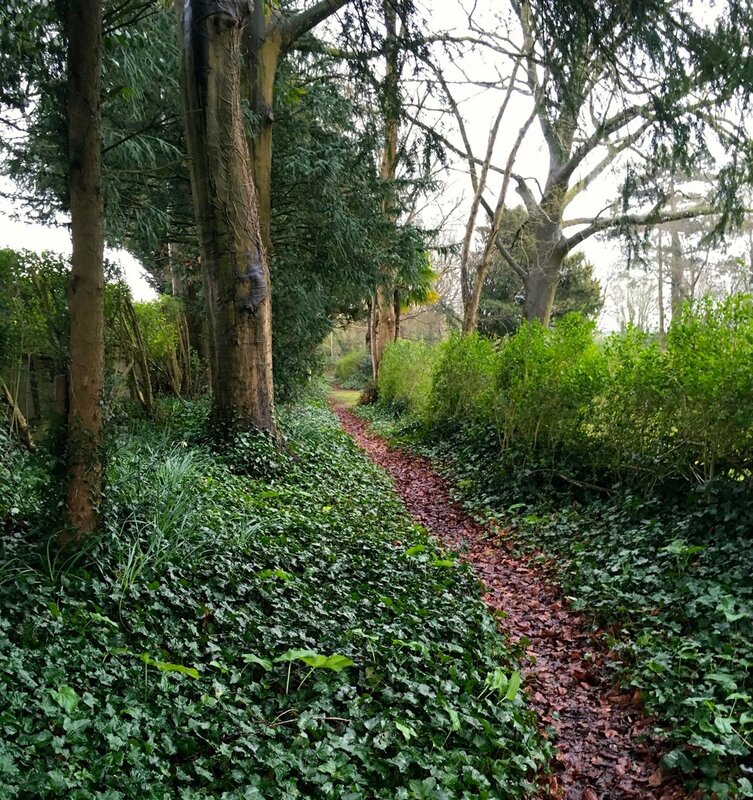 Hardy planted the trees to shelter the garden and gradually created a beautiful garden, with a croquet lawn and the Nut Walk and often he would walk along here every day. The woodland area was great to see as our garden has many trees, and its these gardens which give me ideas of plants to introduce in our garden, especially those that will add some colour interest. The bluebells were about to burst into flower, and the raindrops on the leaves just emphasised their lushness. It was here that I spotted a row of forsythia cuttings in a row and gave me the idea to do something similar. I don't think my cuttings have made it, but I'm definitely going to try this again. I'll leave you with another shot of the house, it really is a good looking house isn't it? - and the recommendation to pop along and see the house and the garden for yourself if you're close by.